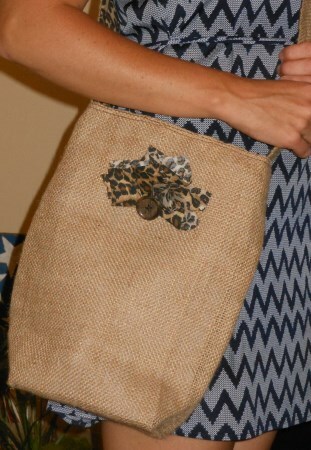 For this cross-body purse I used natural burlap and fully lined it with a cotton fabric in a cheetah print. I added an inside pocket of the same fabric for keys, cell phone, etc., and a magnetic closure. Each seam is sewn twice for durability. The removable "flower", with a brown button center, can be placed wherever you prefer, and can also be worn as a pin. I top-stitched the strap with brown. Finished size is 13" high x 11" wide, with a 45" strap. Please contact me with any questions before ordering. This item ships from United States. An additional charge of $6.50 will be added to each order for the current item.